Can the ailing health care system be cured? Yes, but only with new ideas. 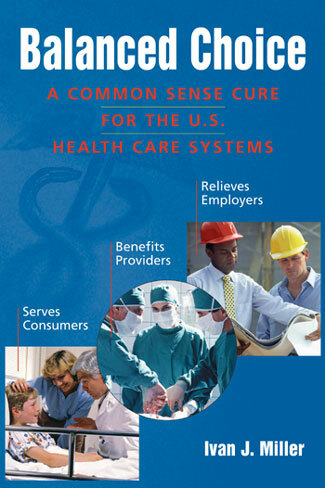 Health care reform is stuck because there has not been an acceptable reform proposal. Providing insurance coverage to more people only increases the total cost of health care, and with insurance, costs are controlled by undesirable increases in the use of managed care. Single payer proposals involve unacceptable government price controls. Balanced Choice has the new ideas needed to fix the health care system. It provides the same universal coverage as a single payer system does, but it does not have government price controls. Overall, it costs less than is currently spent on health care in the U.S. Because it benefits consumers, providers, and employers, the resulting political alliance could be powerful enough to change the U. S. health care systems. This book begins curing the system by explaining how Balanced Choice works and what needs to be done. Ivan J. Miller, Ph. D. has experience in health care as a provider, consumer advocate, employer, and administrator. His diverse background has given him insight into how to put common sense back in health care financing in order to create a system that works.